Magnifying glasses for reading are an inexpensive and handy device for anyone with age-related macular degeneration, low vision, cataracts, or glaucoma as well as many other types of visual impairments. They are also great if you do an activity or have a hobby in which you need to see fine detail. The best kind of magnifiers tends to be different for different people, the best products for you will depend on what your needs are and the type of vision issue you may be having. Because of this, you may need to look carefully at the different magnifying options that are available for reading and weight the pros and cons of each design. We have rounded up some of the best reading magnifiers with various styles including full page, with lights, dome, hand-held and hands-free. The base is hefty, so it is difficult to move around your home. 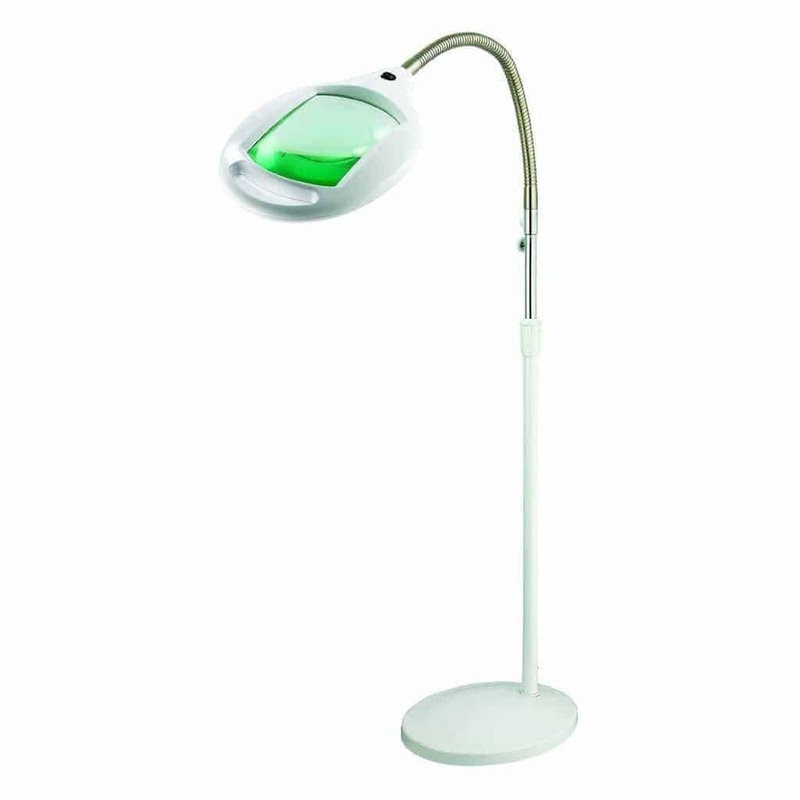 A stand magnifying lamp like this one from Brightech is a bit more of an investment over a simple hand-held reading magnifier, but if your eyesight is failing and you love to read, you should seriously consider one of these types of lamps. They are great for reading because your hands are left free, you can see larger areas, and even though it doesn’t have the strongest magnifying power the light of the lamp makes the text easier to understand. It has a good quality glass lens, and the weighted base makes it very stable if you move the gooseneck around. The light doesn’t get hot, and the field of view is full and doesn’t distort what you are viewing. Some users have complained that the lights blew out within a year of purchase. Comes with a nice carrying case to protect it from scratches. The light illuminates from the side leaving some areas not as well lit. It is a very simple, small, well-designed magnifier. The lens is shatterproof acrylic, which makes it very lightweight, so it is pretty easy to hold. The compact size also means that it is no trouble to carry it with you when you go out. The lens is 2.3″ (W) X 4″ (L), which makes it a suitable size for reading without having to move your hands much. The magnifying power is only 2X, which may be a bit low for some users, but it comes with three LED light bulbs that are positioned within the handle which illuminates what you are reading and makes it easier to see. The lights run on two CR2016 batteries that come with the magnifier. If you are interested in this model but would like a bigger size, Fancii also offers a slightly larger model with stronger magnification. Some users don’t like the positioning of the lights on the side. The magnification isn’t the strongest. Some users don’t like dome style magnifiers for reading. It is a good quality, acrylic lens, paperweight dome magnifier. It has 3 LED lights that run on lithium batteries. 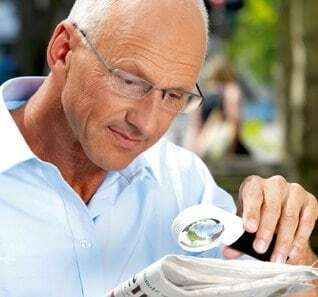 Dome magnifiers aren’t (IMO) the best for reading, but for some people, they work well for reading different types of documents, newspapers or magazines. As far as dome styles go, this one is nice and big (4″ lens), and it will light up when you hold a button down. It has a 5X magnifying power with a reasonably large viewing area. The size of the product means that it is very portable. It is a cheap digital magnifier that works well for menus, price tags, newspapers, and prescription bottles. It has a 3.5 inch LCD and is very lightweight and easy to put into a pocket. It comes with the ability to vary the magnification level between 2X and 32X, with three color modes available. It has rechargeable lithium batteries with a battery life of up to 3.5 hours. It is a Chinese import that is an inexpensive alternative to the expensive ($500 +) digital magnifiers that come from some of the brand names (Eschenbach, Humanwear). It isn’t the highest quality, but it can be quite a handy device for a lot of different types of low vision situations. What is great about reading magnifiers these days is that they come in all different kinds of styles and magnification powers. There is such a big selection to choose from; you shouldn’t have any trouble finding something best for your situation and your vision needs. Some of the different styles include round and rectangular hand-held designs of all different sizes and magnification levels that are ideal for reading text like product labels or mail. You can also get models that you wear around your neck, so they are available and hands-free, so you can use them whenever you might need it. There are many different types of domed styles, which are also great for reading simple text. Along with the basic magnifying features, many of the new models of magnifiers come with LED lights that make a huge difference with how well you can see what you are reading. One of the best styles for an avid reader is the full page lighted stand. They cost a lot more than conventional magnifiers, but many people find this style to be very good if you do a lot of reading. These types generally have a substantial base with a long flexible neck so that the reader can bring them closer or further from their text. 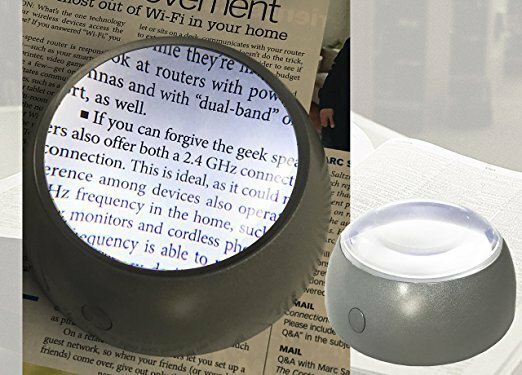 These lamp-style magnifiers are ideal for reading because you can magnify nearly an entire page of text at once. Another style that you may be aware of is the digital reader. They tend to be pricier than regular magnifiers, but are considered by many experts to be the best option for help with reading for low vision. There are two main types of inexpensive digital magnifiers. One type you use a small device that looks like a computer mouse that you scan over what you are trying to read, it then appears magnified onto a TV screen so that you can read it. It works great for reading magazines or newspapers. Some users may find that in some cases these types of magnifiers don’t display enough of the page to be useful, but most users get a lot out of these devices. Another favorite type of digital magnifier is a portable electronic magnifier like this one from ViSee. These types are handy to keep in your pocket or purse so you can pull it out whenever you may need it. They give you the option to magnify whatever you are looking at with different magnification levels and color modes. The various options for customization make them ideal for many individuals vision needs. You can spend quite a lot of money on digital magnifiers. Some run up to $1000 -$1300. That is a lot of money for a product that you may not end up using. If you want to test out a digital magnifier, there are some low-cost options available on Amazon. They are generally Chinese imports, but many individuals find that do an adequate job allowing users to scan fine prints. Most of these types of devices have an LCD, variable magnification levels, and rechargeable batteries. They also have features like autofocus, either color or black and white display and glare and contrast controls. It is easy to forget just how much your vision plays a role in your life. When you start to have trouble reading the small print, it can become very frustrating very quickly. Magnifiers can be a great help for all kinds of everyday tasks including reading mail, prescriptions, instructions for cooking food, reading books, magazines, TV guides, maps and newspapers. It is pretty standard to be able to get any of the different styles with an inexpensive LED light option. Having a light on the magnifier is excellent because it helps to make what you are trying to read clearer. If you haven’t already tried a magnifier with an LED light, you may want something that is dimmable so you can adjust the brightness to your preference. Designs that have lights also act as small reading lamps. Another significant feature to consider is the size of the lens. Depending on what you are reading, you may want to look for a lens that is a mid to large size. There are pros and cons to having a small size versus having a large size. Large sizes generally make it easier to read a larger width document without having to move it too much; the downside is that with the larger sized lens the magnification may not be as good or as strong. If you choose a smaller sized lens, you may get a stronger magnification, but you will end up having to move the magnifier more than you would with a larger lens. Some of the larger lenses come with a bifocal insert. 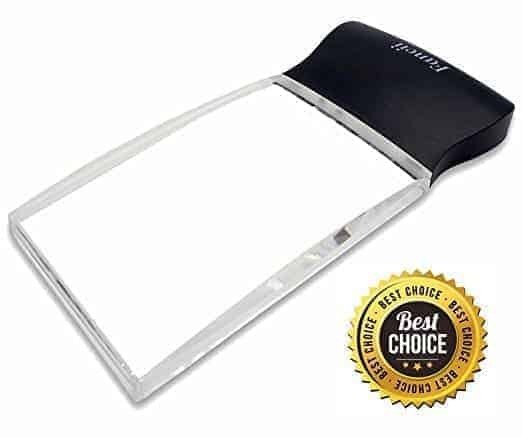 A great product, especially for reading a novel or magazine, is a stand magnifier with a built-in light. They work well if you are trying to read a full a page, they often have adjustable heights and come with “Gooseneck” attachment so you can move it around to get the right position for your specific needs. The weight of the magnifier is something you should also consider when deciding between products. If you are looking for a handheld item, you will want a lightweight product, so it is comfortable to hold. If you are shopping for a floor magnifier that you will want to move to various locations in your home, the weight would also be something you are going to want to consider. One of the disadvantages of getting a handheld magnifier that includes a light is that you may also have to get batteries. The floor lamps usually include a power source. Some products come with rechargeable batteries, or you have to purchase separate batteries. Another product you may want to check out that may be helpful for low vision is the KNFB Reader app. It is an app you can download if you use a smartphone that lets you read almost any type of printed text. There is also a screen-reading computer program called Jaws that gives you speech or braille output for whatever shows up on your computer screen.